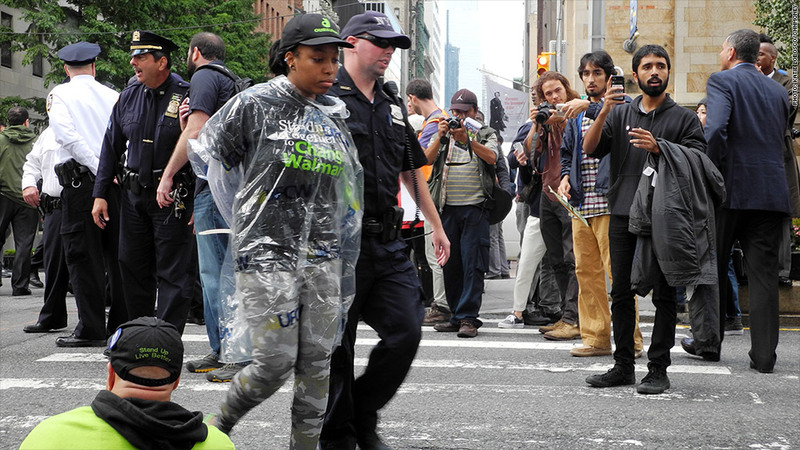 The New York Police Department arrested protesters Thursday who blocked traffic on Park Avenue. Hundreds of protesters picketed outside the home of Alice Walton, the billionaire daughter of Walmart's founder. A total of 26 protesters were arrested when they blocked Park Avenue in the upscale New York neighborhood where Walton's home is located. Another 16 were arrested in a similar protest outside a Walmart office in Washington, D.C. The New York protesters carried signs that said "The Waltons are robbing America" and chanted "What do we want: Respect. When do we want it: Now." The workers had marched to Walton's home to deliver a petition demanding that Walmart (WMT) start paying a minimum wage of $15. They were not allowed in the building. The Walton family is one of the richest in the world. Alice and three other family members are among the top 10 richest Americans. 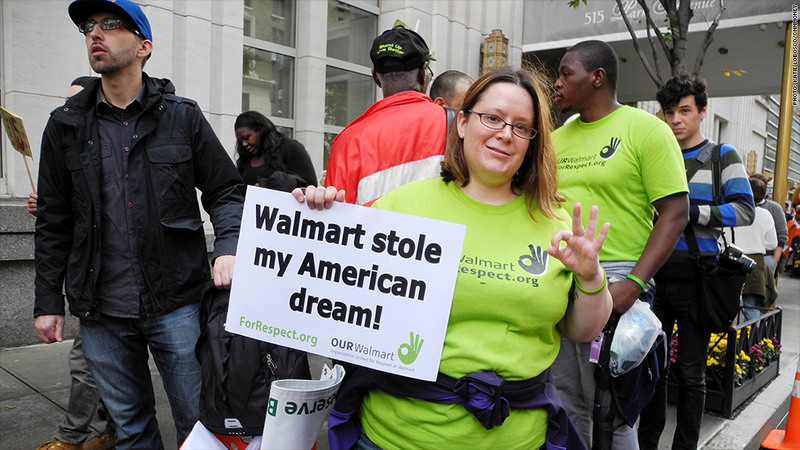 "If Walmart wants to call its workers 'associates', they should start treating us better," said protester Barb Gertz (sitting in a green T-shirt in the photograph below). "We're the reason the Waltons get to be billionaires," she said, minutes before she was arrested for sitting in the middle of the road outside Walton's home. Gertz works the overnight shift at a Walmart in Colorado and flew in Wednesday night for the demonstration. Our Walmart, a union-backed group that helped organize the protests, funded the trip for her and others who traveled from states including Florida, Ohio and Minnesota. Cantare Davunt (photographed below) makes $10.10 an hour after working for five years at a Walmart store in Minnesota. "It's not enough for me," she said. "And other customer service reps make even less than I do." Fast-food and other retail workers also joined the march and made stops outside a McDonald's (MCD) and Zara. Many of the demonstrators were not employees of the three companies, but said they supported the cause. 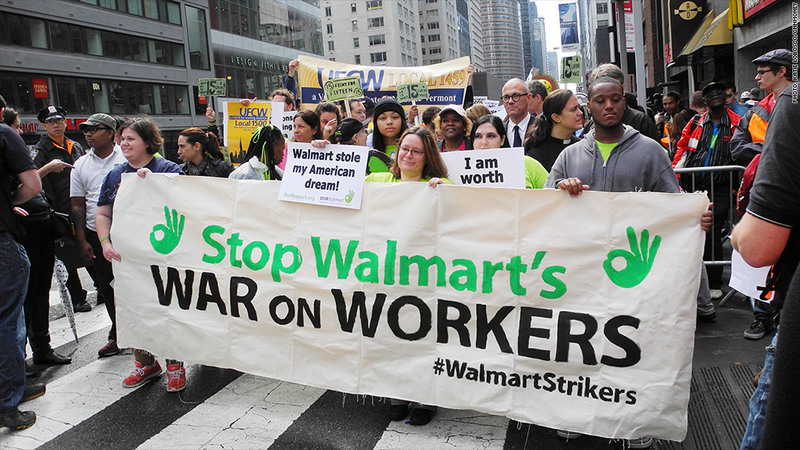 Walmart doesn't actually have any locations in New York City and most if not all of the workers who marched Thursday were from out of state. The company has been a big focus of protesters seeking better pay. Some Walmart employees rely on food stamps and other assistance. For example, a recent study in Wisconsin found that 3,216 Walmart employees enrolled in the state's public health care programs, more than the employees of any other company. Walmart spokesman Kory Lundberg said a very small percentage of the more than 2 million people who work for the retail store take part in these demonstrations because most workers appreciate the opportunities the company offers, like career advancement, quarterly bonuses, and three-week advance notice of schedules. Walmart offers health care for its workers, but is cutting that benefit for anyone working fewer than 30 hours a week as of January. Another group of protesters gathered in front of the Walton Family Foundation office in Washington, D.C., where 16 demonstrators were arrested, according to Our Walmart. Fast-food and retail workers began participating in demonstrations demanding better pay, fair schedules and affordable health care about two years ago. Some of the first protests took place on Black Friday of 2012 at Walmart stores nationwide. The protests have picked up steam since then and many states and cities have passed laws increasing their own minimum wages.